NEWS ANALYSIS: Deposed Justice Minister Sylvi Listhaug’s recent political assault on the Norwegian Labour Party continues to resonate, because of how it exposed threats from right-wing extremists. That likely wasn’t her intention, but so-called “dark forces” emerged to support Listhaug and that’s set off a new discussion over the danger they present, not least in a country still suffering from one home-grown right-wing extremist’s deadly rage. 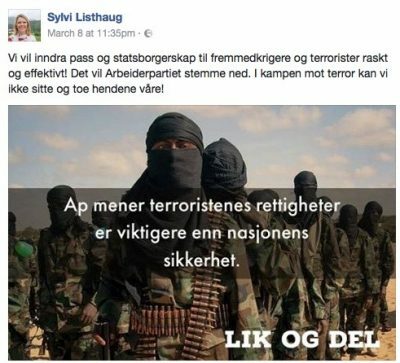 Listhaug set off a political uproar in Norway on March 9, after she’d published a post on her Facebook page late the night before that featured a photo she’d used (without permission from the Associated Press) featuring Islamic jihadists. The text that her also-now-deposed adviser emblazoned over the photo claimed that the Labour Party put the rights of terrorists above national security. It was Listhaug’s reaction to how Labour had voted with a majority in Parliament to halt her ministry’s attempts to revoke the Norwegian passports of convicted terrorists without due process in court. The response to Listhaug’s post was swift and furious, ending last week with Listhaug finally admitting her claim was false, unsuccessfully apologizing “to those who felt offended” and ultimately resigning after learning she faced a no-confidence vote in Parliament. She had greatly offended Norwegian survivors of terror carried out not by Islamic jihadists but by a former member of her own conservative Progress Party. Many also felt she had unfairly singled out Labour when it was only one of several political parties in Parliament that voted against her ministry’s proposal. March 9 was also the day that a new film opened in Norway about the horrors of a home-grown right-wing extremist’s political attacks on July 22, 2011. It concentrates on his massacre at a Labour Party youth camp on the island of Utøya, and the terror to which hundreds of mostly young and aspiring Labour members were subjected as he wandered around the island dressed as a police officer, gunning them down after he’d bombed the Oslo headquarters of Norway’s Labour-led government at the time. He’d killed 77 people by the time police finally halted his rampage that he claimed was politically motivated: He immediately told police he’d targeted the Labour Party because he blamed it for allowing too many immigrants and Muslims into Norway over the years. Norwegians have been streaming to cinemas to see the new film, Utøya 22. juli, which has attracted the most viewers at Norwegian cinemas during the past week. Oslo, Stavanger, Drammen and Moss are among the cities where the film that opened two weeks ago is still seeing visitor numbers climb. Even on a sunny Palm Sunday, with the hills around Oslo beckoning with their ski trails, a showing at the Vika Cinema in downtown Oslo attracted viewers of all ages in the middle of the afternoon. The film received rave reviews and was shown at the Berlin Film Festival last month, but the strong visitor numbers have surprised film critics and even Utøya survivors. Many thought the film’s detailed and factually-based account of the right-wing extremist’s massacre on the island of Utøya would be too tough for many Norwegians to watch, and stir up too many painful memories after just seven years. Christin Berg, program director for Nordisk Film Kino, which runs cinemas in several Norwegian cities, said she thinks Listhaug and her own assault on Labour sparked much of the interest. “All films are helped when people are talking about their themes,” Berg said. Listhaug renewed concerns about terrorism, although not, perhaps, the type of terrorism on which she concentrates. 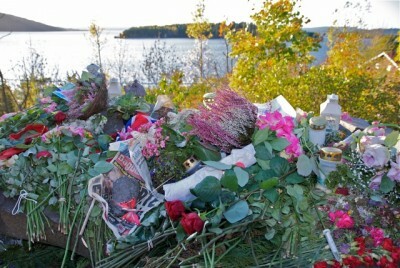 The theme behind Utøya 22. juli has nonethtless dominated the news since its premiere. Utøya survivors and victims’ families, meanwhile, are also finally speaking up about the threats they still face. Many haven’t wanted to revive the horrors of Utøya themselves, have been concerned about the films being made about Utøya and hadn’t shared the threats they’ve received from extremists since. When Listhaug’s initial Facebook post, and several that followed it up, attracted comments of support that many found equally offensive and even threatening, they responded with the authority of those who’ve personally experienced a right-wing extremist’s own form of terror. Other expressions of hate were sent directly to those who’d challenged them on Listhaug’s Facebook page. One young survivor and her father told Norwegian Broadcasting (NRK) how they’d received death threats during the past week from anonymous supporters of Listhaug. So did many others, and they’ve reported them to police. The main problem Aukrust and other Labour officials have cited is that such hatred, which they believe was unleashed by Listhaug, is “terribly frightening” because it can prompt so much violence. Aukrust said he was relieved to see the waves of counter-comments that suddenly appeared on social media, and how the right-wing threat is being discussed. “Folks are saying that ‘enough is enough,’ such hatred can’t be allowed to spread,” Aukrust told Dagsavisen. “It’s time to confront it.” Labour Party leader Jonas Gahr Støre, meanwhile, has also claimed in Parliament that the type of hatred Listhaug “ignited” is “dangerous.” He’s been assigned bodyguards because of threats to his own safety. Calls have also gone out for Prime Minister Erna Solberg, who narrowly survived seeing her government coalition fall because of Listhaug, to show a better understanding of how hatred and extremism of all types can be dangerous. “Claims that social democrats, feminists and Muslims together are behind a conspiracy to replace Norway’s population with immigrants live their dangerous lives online and among extremists,” wrote Hadia Tajik, deputy leader of the Labour Party, in newspaper Aftenposten on Sunday. She also believes Listhaug, by urging her followers to “like and share” her claim that she later was forced to delete, was perpetuating a false claim while also lending authority to it as justice minister. Listhaug’s claims that her freedom of expression was infringed upon have been widely dismissed. Tajik wrote that “we’re all free to have our own opinions, but if we try to have our own truths where alternative facts apply, we must be confronted. That’s what happened to Listhaug.” The former justice minister did not survive the confrontation of a majority in Parliament poised to vote that they lacked confidence in her. Listhaug’s Progress Party, however, could report a rush of new members last week. Around 800 people joined the party on the day Listhaug resigned as justice minister, and another 700 joined during the course of the drama surrounding her. “I think this must be a new record for the party,” said its leader Siv Jensen, who also serves as Norway’s finance minister and supported Listhaug. “It’s very nice.” The party also jumped in public opinion polls, indicating how many people latched on to Listhaug instead of being repelled by her and her controversial claims. Aslaug Timland Dale, a director of Norway’s mental health agency, reports that its telephone help-line has been busy lately with young people calling in to talk after seeing Utøya 22. juli. Dale also thinks the drama around Listhaug has prompted others to call. “Many of those calling say they’re worried about how dark forces out there can escalate,” Dale told Norwegian Broadcasting (NRK). 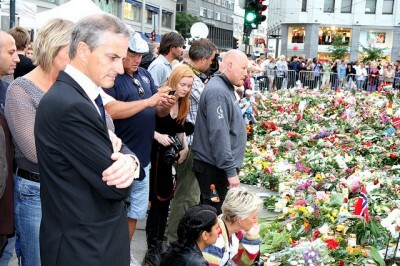 “When Listhaug also showed off all the flowers she received from supporters (some of which came from anti-immigration groups and organizations associated with white supremacy), many people interpreted it as proof that there still are forces out there who hail what happened on the 22nd of July 2011.” Listhaug has claimed that such “dark forces” are in the minority and that she distances herself from them. 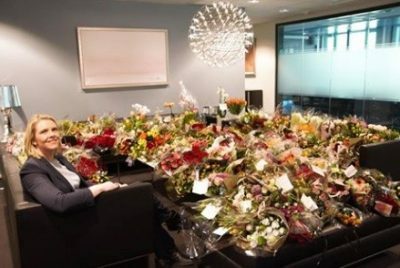 The justice ministry, meanwhile, has had trouble dealing with all the hundreds of flower bouquets that arrived for Listhaug. Employees at the ministry objected to them being displayed around the ministry’s offices and few were willing to accept an offer that they could take flowers home themselves. Newspaper Dagens Næringsliv (DN) reported that the offer raised so many objections that ministry administrators withdrew it. Listhaug, who has declined most interviews and mostly communicated on her own terms through Facebook, reportedly has flown off to the US on an extended Easter holiday with her family, and thus couldn’t take many of the flowers home herself. A counter-demonstration to the flower campaign, meanwhile, engaged tens of thousands of Norwegians who raised nearly NOK 18 million for the neutral humanitarian organization Leger Uten Grenser (Doctors Without Border) in just a few days.